A little over 2 months ago, I put out a request for quilt blocks. I spent most of last week sorting through all of the blocks received, trimming them down to size (if needed), sewing a bit more fabric to get them up to size (if needed), and making a few more blocks for each quilt to get them to a size and layout to make a nice lap quilt. 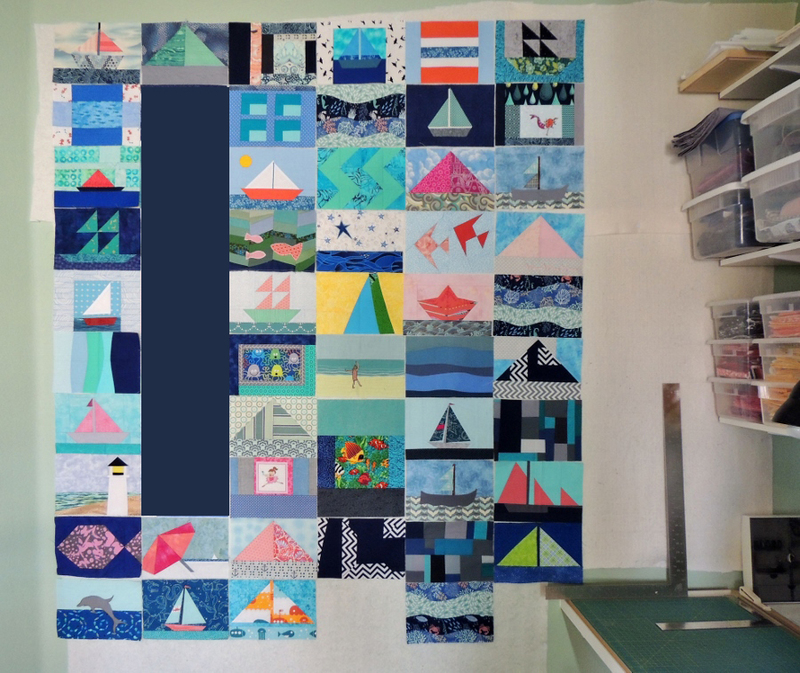 Each quilt will have 60 blocks and finish around 57 inches by 65 inches! The quilts have letters that spell out the children’s names, and I have blocked them out of the images below to protect their privacy. Fewer people sent in blocks for Mr. L’s quilt, which turned out to be pretty much perfect. I was able to sew together more keyboard blocks to create two nice keyboard borders to finish out the quilt! There are also 3 blocks that are only single pieces of fabric at the moment, but Mr. L and a local friend are going to work on blocks to replace them. Thank you so much to everyone who contributed to these quilts. Miss A and Mr. L’s mother was moved to tears and touched by how many people have reached out to participate in creating these quilts. I am really excited to get together with the children and determine the final layout of the blocks! They look awesome! I love how kind and supportive the quilting community is. These quilts are wonderful! I really love the keyboard borders, and it’s so great to see how many people joined in to help you give these kids something so special. I’m so glad A and L’s mamma was pleased! They say it takes a village; thanks for creating an opportunity for us to participate, Yvonne! The two quilts looks so great Yvonne! Love that keyboard border too, it could not be more perfect. It is fascinating to look closely at all the blocks and what a fun variety. I’m moved to tears myself. The children will have a wonderful time choosing the layout and putting together their quilts with you. Love the keyboard borders – they look fantastic! Those are going to be such great keepsakes for both of those children. I don’t know who made the treble clef with the turquoise background on Mr. L’s quilt, but it’s my absolute favorite block. I just love it! What a lovely gift. So pretty and colorful too. I love the keyboard blocks. They look so great! I’m so excited to see this come together! 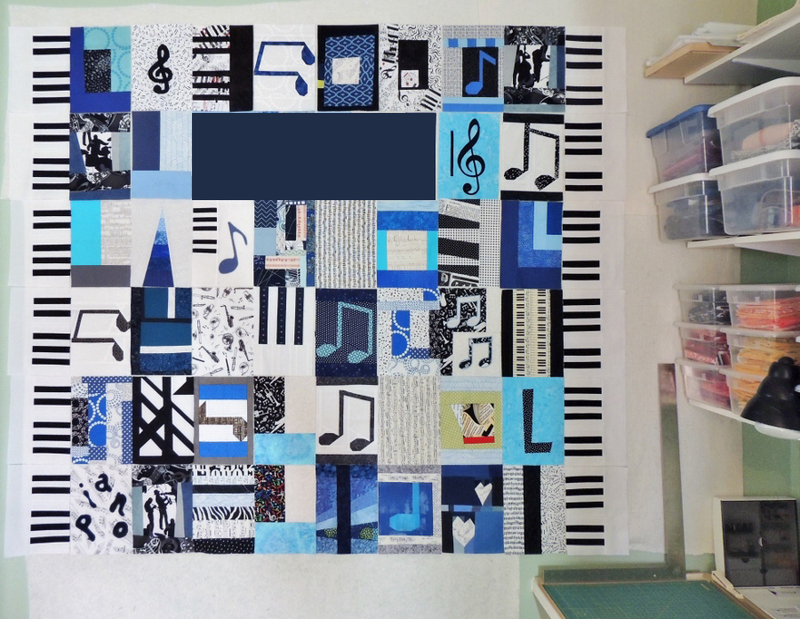 Both quilts are very nice, but I’m really loving that music quilt. These look great! And as a data-loving math geek, I really love the map view of the contributors. Can’t wait to show this post to my son tomorrow so he can see his blocks in the big picture. Sweet! They look so good together. And I just love how they are involved in the making of their own quilt. I like the solid bits of fabric blocks. Is that weird? I think they add something. I absolutely love the keyboard border; it is the perfect addition. The look beautiful. Great idea!!! Isn’t it amazing how good the blocks all look together? What a heartwarming project Yvonne. These are turning out soooooo good! So happy that you are doing these… this is so amazing. I can’t wait to see the final layout and I can’t wait to check out your quilting! They’re looking great, you’ve done such a good job with the layout and it’s amazing how well all the blocks tone together. It is so wonderful to see their quilts come together! The blocks are so fun, I love the map of where all of them are from! I bet the kids and their mom will treasure these quilts always. WOW! They look fantastic!! I had no doubt that they would 🙂 So fun to see the blocks all arranged on your wall! The piano border was a great idea! I missed the reason you asked – but those are Fantabulous quilts!!! The music one is AWESOME!! Pingback: My Improv Process: Selecting fabrics and piecing | Ants to Sugar – Quilter. Fabric Collector. Paper Piecer.